Perhaps the oldest horror short story featured at American Literature, The Vampyre is considered the first in a genre which became known as romantic vampire gothic fiction. Lord Ruthven is the original seductive vampire character, a precursor to blood-thirsty romantic vampire heart-throbs like Twilight's Edward Cullen, etc. 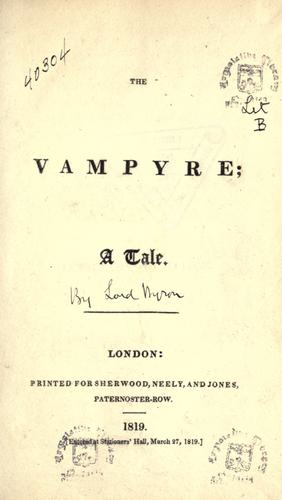 Interesting fact: The Vampyre was first published in 1819 in the New Monthly Magazine with the false attribution A Tale by Lord Byron since Polidori includes an account of his travels with Lord Byron. Its true authorship was later corrected. Polidori's groundbreaking seductive story inspired numerous vampire-themed works, including the 1945 movie The Vampire's Ghost, with the Lord Ruthven character changed to "Webb Fallon" and set in Africa. In 1992, the BBC broadcast The Vampyr: A Soap Opera which was based on the German opera Der Vampyr by Heinrich Marschner. The vampire, disguised as a successful businessman named "Ripley" was revived after being frozen since the late eighteenth century. This novel's original title was The Vampyre; A Tale. Return to the John William Polidori library.